Lift the tail of Bubbles the cow and a gumball will drop into the bucket. Cavity in cow’s stomach holds about 125 standard size gumballs, 9/16" diameter. Wood milk bucket in back of project catches the gumballs. Bubbles is made from 1/4" Baltic Birch plywood and 3/4" stock. All patterns drawn FULL SIZE. 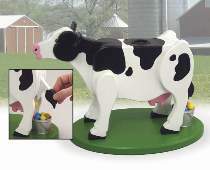 Measures 9-1/2"H x 8"W x 14.5"L. Bubblegum Cow Hardware includes wood bucket, plastic refill plug and .25 inch x 12 inches x 12 inches plywood. Project plan, gumballs, remaining wood and wood finish not included. Order hardware package separately below.